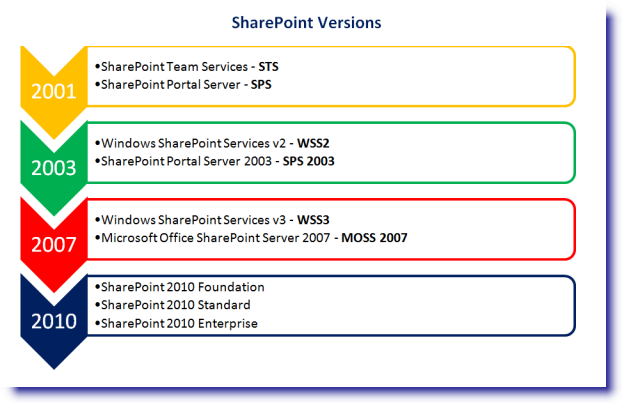 SharePoint Versions through the ages – Confused? Last year, when I first started having dealings with SharePoint, I was mightily confused by all this “MOSS”, “WSS”, “SPS” -stuff. What did all these acronyms stand for? What was the difference between all these different versions of SharePoint? And did it really matter? So, in the begining, back in 2001, SharePoint emerged as two distinct products. SharePoint Team Services was a bottom up team collaboration product, SharePoint Portal Server was a top down, portal, search and document management product. By 2003 Microsoft had gathered that although customers liked both products what they would really like was the capabilities of both, combined. So in 2003 what most of us would recognise as SharePoint: collaboration, search, content management and portal capabilities all under one roof – was born. In essence, WSS gives you a place to put all your content while SPS provides the means to navigate and search through your content when you need it. In 2007 much the same formula was followed, with Windows SharePoint services as the free version for windows server users and Microsoft Office SharePoint Services the premium version. The MOSS designation references the greater level of integration with the Office suite. In SharePoint 2010 it’s all change again and Microsoft have dropped references to both Office and Windows, leaving SharePoint to stand alone in 3 basic flavours: foundation, the free version, Standard – the premium version, which adds lots of functionality primarily around the area of search, and Enterprise – super premium, where the extras are pricipally in the area of content management. This is very much a whistle stop tour, not an attempt to give an all encompassing overview of what is in each of the many SharePoint versions we have seen over the years – but we hope it might help you to at least get the acronyms straight!